Used several layers, changed hue and made the background into B&W, made layer opacity adjustments, added stars and clouds using brushes… Just for the fun of it!! The alien is an Australian tree fern leave bud, everything else was made up. Nope. You didn't push this one too far. Nope. it's wonderfully off the wall and I love it. 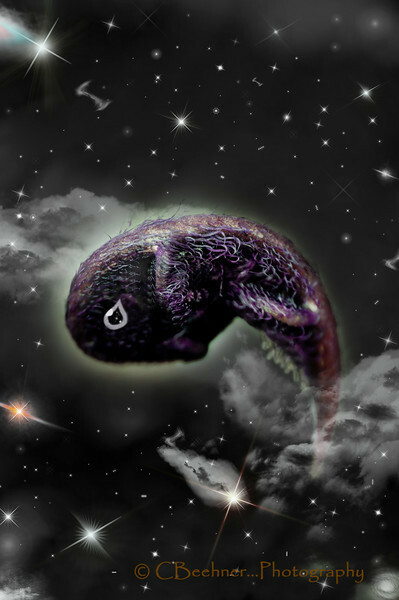 super cool... this is way out there.. from the thumbnail.. i thought, embryo.. no way! You've moving toward scifi book cover material here:-) Great creativity. It almost resembles a shot from Hubble or other telescope looking into the galaxy that are colorized. But I agree with Paula :o), the eye and 4-5pt stars are just a hair too much for me. But a well blended composite!!! Nice job Chuck!